Bhakti Shringarpure, editor of (one of our ), interviewed Laila El-Haddad and Maggie Schmitt, the authors of The Gaza Kitchen: A Palestinian Culinary Journey, a cookbook that's not just a cookbook, but a portrait of Gaza history, politics, economics, and feminism. 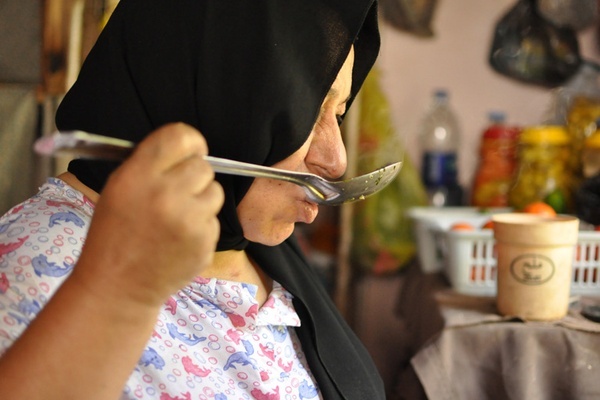 GAZA, Palestine – Food is inextricably tied to identity, and cookbooks can transcend recipes to become forums for assembling narratives and archiving heritages, no matter how tiny the actual places or marginalized the cultures from which they arise. The motivations for writing a cookbook are only exacerbated when framed by issues of dispossession and displacement, and the overarching violence of war that may drive it all. There is something obvious, then, about the imperative to write a book about Palestinian cuisine, but the extraordinary delicacy with which Laila El-Haddad and Maggie Schmitt have composed is less so. 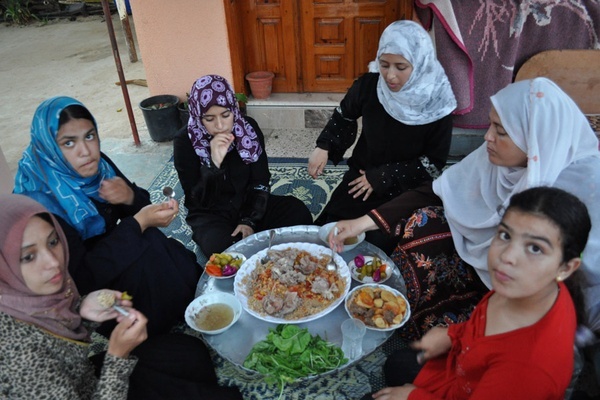 Cuisine from Gaza forms only one component in a book that maintains an exquisite choreography between ethnographic document, feminist storytelling, land and agricultural politics, developmental economics, and Gaza's troubled history. is a writer, activist, and spirited creator of the award-winning blog , which went on to become the book . 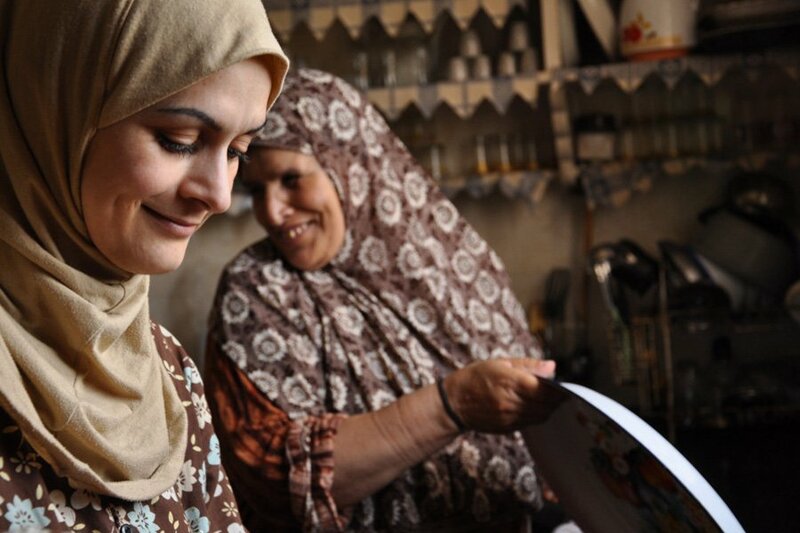 , a writer, translator, and educator, based in Spain, has developed what she calls "a hermeneutics of the kitchen," which forms the intellectual backbone of Gaza Kitchen. One of many kitchens Laila and Maggie visited. How did you arrive at writing a cookbook? Laila El-Haddad: I grew up as a child of diaspora, to Palestinian parents from Gaza City and Khan Younis, living in the Gulf. We'd commute to Gaza regularly, but I always felt somewhat absent, disconnected, dispossessed of my identity and place in the world, on the maps, in books, never really fitting in. So my culinary interest evolved from this starting point: food as a bridge, as a link, as a way to locate oneself. The fact that the foods my parents recollected from their childhoods seemed so different from any other Palestinian foods I was familiar with piqued my interest even more. Why was the food of Gaza so distinct, so varied, even in an area as small as Gaza (between my mother's town, for example, and my father's hometown)? I took pleasure in uncovering what I viewed as treasured secrets and sharing them with others as a way to start a conversation about Gaza and about Palestine in general. Maggie Schmitt: I've always loved food and cooking, and as a constant traveler have long known that snooping around kitchens is one of the best ways to get into intimate spaces, have with women's worlds and understand more about what's really going on. But it was never a professional pursuit, just an interest. When I was writing for The Atlantic's food page, I got totally hooked on food as a point of entry, a way of talking about all kinds of other things — history, politics, economy, social change, aesthetics. So the article I did from Gaza was one of a series of food-related dispatches from different places. Writing from a food perspective got me thinking about different methodologies. I started doing what I called "kitchen anthropology." 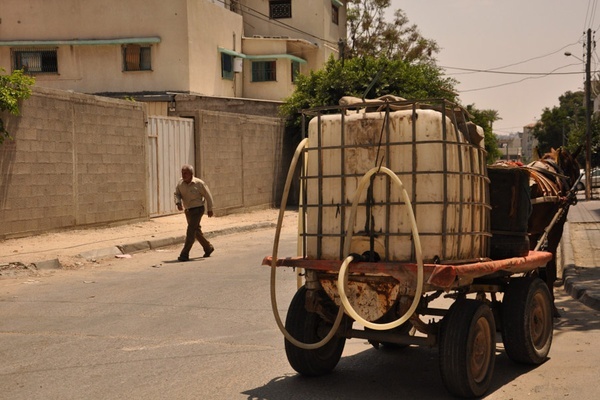 This is the method we then took to Gaza to do the field work. "Kitchen anthropology" describes your book perfectly. The brilliant thing about it is that recipes are interspersed with vignettes either about the conflict or histories of ingredients or agricultural initiatives. But a large space is devoted to short portraits of Gazan women. LEH: Palestinian women's voices, especially in Gaza, are so often glossed over completely, or else represented in a very caricatured, mediated way by the press. What you end up getting are very reductionist portrayals: either shrouded, oppressed, obedient women, or as Western feminists' challenges to supposedly brutal Islamist rule. Otherwise, it is the images of wailing women that dominate the television screens. Seldom at all are we hearing and seeing the dignity and grace and constant steadfastness in which Palestinian women carry on with their lives. MS: When we were touring, one audience member asked if we thought of the project as a feminist one. The answer for me is a clear "yes." Perhaps the most obvious or visible reason is the focus throughout the book on women's lives and women's knowledge. It was important for us to focus on women's lives because they are so seldom and so poorly represented in any media portrayal of Gaza. The types of resistance available to women are particularly interesting. They themselves understand their daily tasks — the upkeep of their homes and the care of their families — as a form of steadfast resistance. LEH: Being able to carry on with their lives, to often be the breadwinners in their families, to keep their families together through thick and thin against impossible odds, over decades, and to retain their dignity despite it all — this is really the ultimate form of nonviolent resistance, one that goes unseen, that is occurring on a massive scale. You also begin to uncover the reality that the power dynamics shift in those private spaces. Suddenly, it's the women giving orders to the men: It's their domain. Addoula tasting bisara for salt. 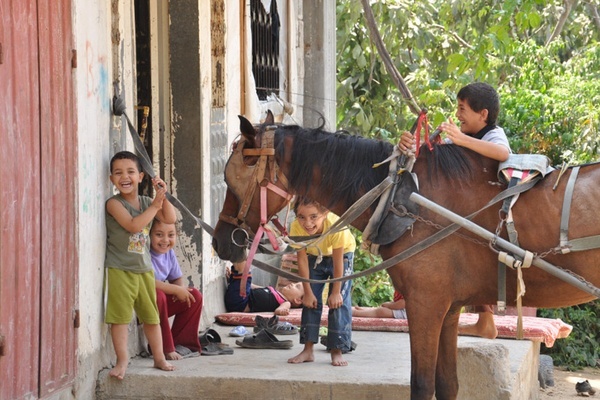 Taken in Garara, Eastern Gaza Strip. 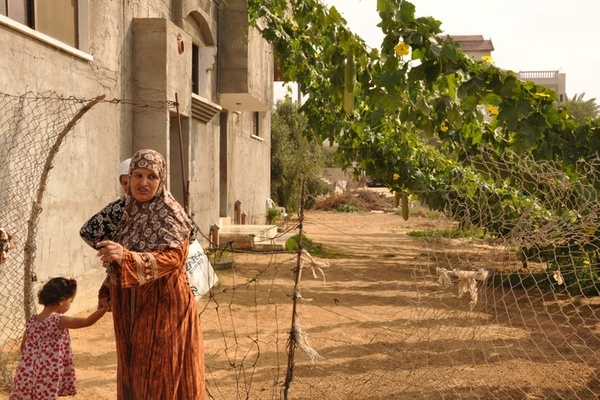 In "Slow Food on the Gaza Strip," you write about Gazans using small-scale agriculture and old methods of cooking and conservation — small plots of land, dovecotes, and rabbit hutches on the roof, reverting to traditional pickling and jam-making due to electricity cuts. Could you tell us more about this? What is the scale of this movement? LEH: We certainly witnessed a great deal of handiness around the home — marveled at the ways in which women would make ends meet and could put mouth-watering foods on the table with whatever they had access to. What we witnessed was remarkable: Women continuously adapting, managing their households with incredible efficiency, overcoming obstacle after obstacle, policy after policy that very much intend to debilitate them, their livelihoods, their productivity, their freedom. 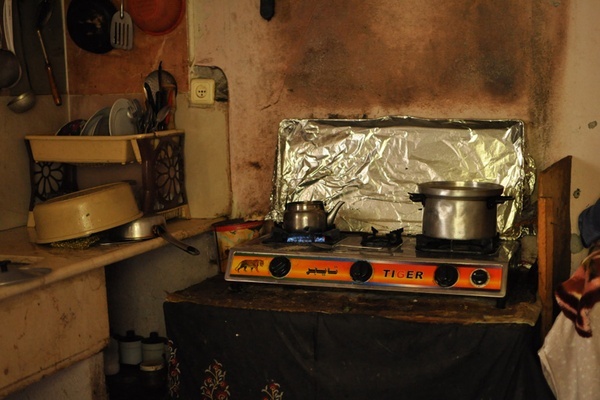 When long-term electricity cuts became a reality, in conjunction with restrictions on the import of cooking gas, women returned to using traditional clay ovens to bake bread in (many still do, but not on the scale they once did in 2009, since cooking gas has been smuggled in through the tunnels). One woman we met, Addoula, buries her lemons in her garden to keep them from spoiling, since the mineral clay is much cooler than the searing heat of the kitchen. Basically, for every obstacle there is an innovation or adaptation. Restrictions on fishing zones prompted two entrepreneurial brothers to start Gaza's first inland fish farm, and on and on. To some extent, Palestinians have been doing this for generations. I think, generally, the current situation aside, Palestinians have a history of "home economics," if you will. There is even a Palestinian saying, Mat ool fa'eer, ool ilit tadbeer, which means "don't say you're poor, say you can't manage what you have." I imagine this had to be put to the test not just in recent years in Gaza, but over the course of the past few decades, at various historical intervals, dating back to 1948 and perhaps before, during the drought of the 1930s. But this is happening in pretty much every household (maybe with the exception of Gaza's upper crust). The was originally published on and is reprinted here with permission. Bhakti is the founder and editor of , one of Gentedimontagna's . Follow Warscapes on and at @Warscapes. She travels for that dull ache of discomfort and exile because it is always followed by a resounding epiphany, one that inadvertently changes you.